Sandefjord Kurbad ble grunnlagt av dr H.A. Thaulow i 1837. Det nåværende bygget ble oppført i dragestil i 1899, etter inspirasjon fra vikingfunnene i Gokstadhaugen noen år tidligere. Badet var velkjent for sine helsebringende gytjebad og behandlinger, og var i drift helt fram til annen verdenskrig, da det ble tvunget til å stenge dørene. Under krigen brukte okkupantene kurbadet til blant annet stall, og ødeleggelsene på bygningen var så store at det senere ikke ble funnet lønnsomt å ta opp igjen driften av kurbadet. Bygget fortsatte å forfalle i mange år og var lenge rivningstruet, men idealister dannet Kurbadets Venner i 1980, og fikk kommunen til å vedta bevaring til kulturformål. Bygget sto ferdig restaurert i 1987 og eies i dag av Stiftelsen Sandefjord Kurbad, som har ansvar for drift, vedlikehold og utleie av bygningen. Kurbadet huser ulike kulturelle grupper og foreninger, musikk- og coctailbar, og fremstår som en levende kulturinstitusjon i Sandefjord. 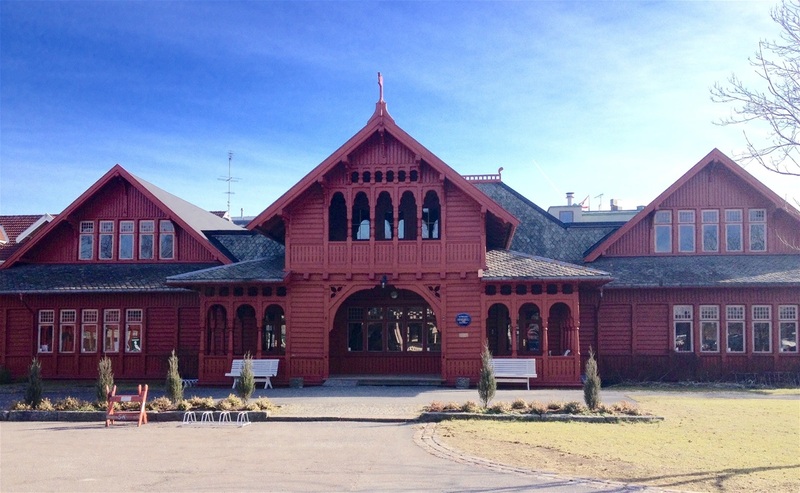 Sandefjord Health Spa was a medicinal spa resort, founded by Dr H.A. Thaulow in 1837. The present building dates back to 1899, and was built in the Norwegian 'Dragon Style' ;inspired by the excavations of the Gokstad Haug; which contained a viking grave; a few years earlier. The Health Spa was renowned for its mud-baths and treatments, and remained a popular health resort until it was forced to close down when World War II broke out. During the War the occupants used the facilities; amongst other things; as stables, and due to the destructions it was not economically viable to reopen the Health Spa. The building continued to deteriorate over the years, but in 1980 a group of idealists founded Kurbadets Venner/Friends of the Health Spa , and they had the City Council call for preservation of the Health Spa, for cultural purposes. 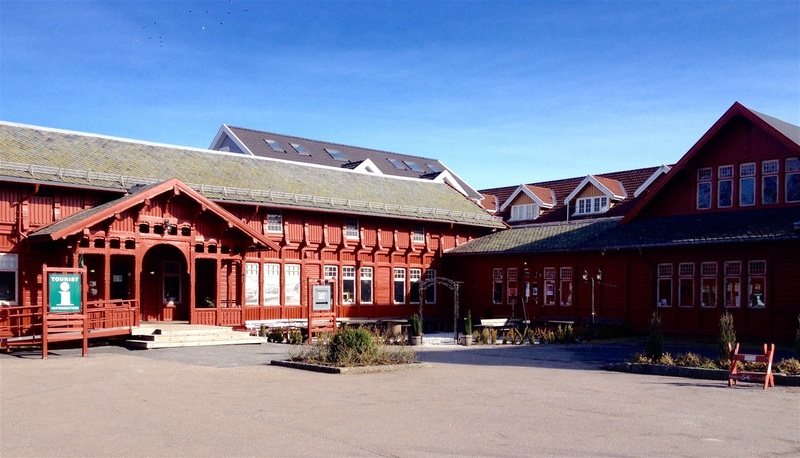 By 1987 it was restored to its former glory, and now owned and run by the Foundation Sandefjord Kurbad, it is a vibrant, cultural institution in Sandefjord, housing a great variety of local groups and associations, in addition to a music bar&cafe. The little, red house next to Sandefjord Health Spa was built a few years after World War II, on the grounds of the Health Spa's previous office buildings. Here, Mr Odd L. Brown established a candy- and tobacco shop in the early 1950's, running for over 40 years, becoming an institution amongst locals - quite a few kids went candy shopping here over the years! 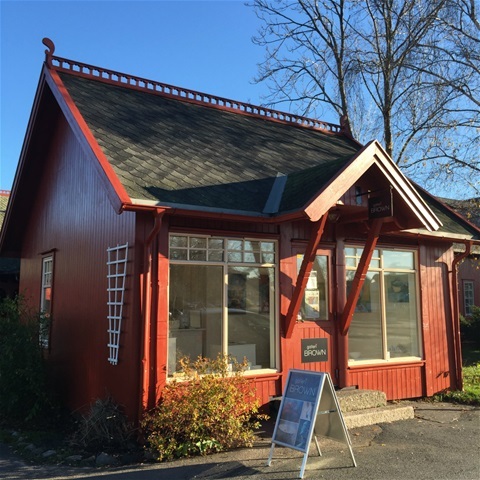 The Foundation Sandefjord Kurbad in 1994 acquired the little house from the City Council and redecorated the exteriors to match its impressive neighbour - Kurbadet (one of the largest preserved wooden structures of its time, in Northern Europe) and the little shop stayed on for many years. The shop; locally named 'the Brown kiosk'; even though it closed down in the early 1990's and the building since then, among other things, has housed The Foundation Sandefjord Kurbad's offices and an Old Book Shop, still lingers on people's minds. This tiny piece of local history was something we wanted to bring forward when we were so lucky to move into the house in 2014 - hence our gallery's name: 'Galleri Brown'.